The global foldable display market is expected to grow to 63 million units in 2022, with revenue of $8.9 billion, according to a US display research firm. But doubts remain over whether consumers are willing to pay high prices for new foldable devices, as growth of the smartphone market is losing steam globally. Display Supply Chain Consultants said in its latest report that the foldable display market is expected to reach 3.1 million units in 2019, with Samsung Electronics and Huawei launching new devices in the first quarter of next year. “After 2019, the market is predicted to accelerate as costs and prices fall, availability improves and competition increases, enabling foldable displays to expand into tablets, laptops and other market segments,” the report said. DSCC predicted the foldable display market for all applications would grow to 63 million units by 2022, at a CAGR of 173 percent increase. As for revenue, it would see 151 percent growth to reach $8.9 billion in 2022. “We met with many brands and panel suppliers and discussed their road maps, and most are quite excited about the long-term prospects for foldable displays,” said DSCC CEO Ross Young. He added that tech firms are hoping the innovative form and ability to incorporate larger displays into smaller forms will raise average selling prices and revenues. 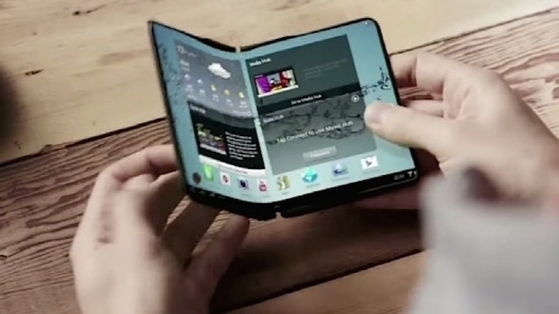 A foldable phone is a new device that can be used as a normal smartphone when it is folded, and as a tablet when it is unfolded. The development of the new device is not an option but a “must” for some tech firms that seek to achieve a breakthrough amid slow growth of handset sales. Consumers have not been as enthusiastic as expected over latest technologies related to security, cameras and panels unveiled by smartphone makers. The growth rate of the global smartphone market in terms of shipments dropped to 1.3 percent last year from 12.2 percent in 2015, according to Strategy Analytics. It is expected to drop to 0.5 percent this year. Despite the long-awaited release, global tech firms have been hesitant due to uncertainties over whether foldable devices will attract consumers, given the expected high prices. “The smartphone makers already have technologies to produce foldable phones but they have delayed the mass product as they have doubts over marketability,” said Kim Jang-ryeol, chief of Golden Bridge Investment & Securities’ research center. “(In order to attract consumers), they will need killer application. Otherwise, there won’t be many consumers who are willing to pay for the expensive devices,” he said, adding that mainly businessmen and gamers are likely to purchase the products. Prices of foldable phones are expected to be over $2,000, which is higher than current premium smartphones hovering at around $1,500. Due to the cautious view, stocks related to foldable products from Kolon Industries, SKC Kolon PI and S-mac have been calm over the past year despite the yearlong buzz created by news reports and Samsung CEO Koh Dong-jin, who said in August that development is nearing its end.